This breakfast sweet potato is simple, satisfying and SO delicious! You know those days when you wake up ravenous and you need something more than yogurt with granola and fruit? This breakfast sweet potato will have your back. It’s full of Vitamin C, fiber and protein. 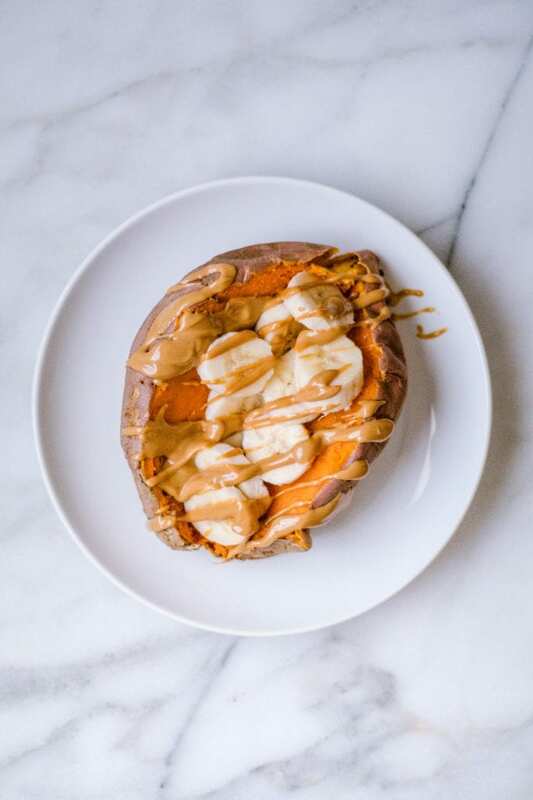 The sweet potato and peanut butter combination is to die for. Especially since the sweet potato is warm and the peanut butter becomes melty!! I’m getting a vegetable in first thing in the morning. Yes, it’s a starchy, sweet-tasting veggie but hey, still a veggie!! With all of the screen time we get these days (computer, phones, tv, etc.) sweet potatoes are great to include in the diet since they may slow aging by promoting good vision. I love finding ways to add peanut butter to my breakfast because I find I am fuller longer, and not ravenous 2 hours after breakfast. Thanks to the fiber, protein and good fats in the peanut butter, it will keep you satisfied too! This list goes on and on why I love this recipe breakfast so much! And so far, you can see how simple this is to make! Grab a sweet potato. Wash it and dry it. Poke holes in it with a fork and wrap it in a paper towel and cook in the microwave until you can stick a fork all the way thru and it feels done (soft). Carefully cut the sweet potato in half and place banana slices on the sweet potato. 5. Grab your favorite peanut butter and drizzle it on top of the banana slices. Sometimes if my peanut butter is hard – I place some in a microwave safe dish and heat it for 30 seconds so it’s easier to work with for a drizzle. 6. Last but not least, top with chia seeds and ground cinnamon! Sometimes I top with a drizzle of honey, but it’s naturally sweet on it’s own! I hope you love making this breakfast as much as I do! The neat thing about break sweet potatoes is that they are 100% customizable! You don’t like peanut butter? Try cashew butter or almond butter. Allergic? Soy nut nutter of sunflower butter a great options too! Top with chocolate chips, crushed walnuts, other fruits, flaxseed, honey, maple syrup. Add protein by topping an egg on the sweet potato and saving the banana and peanut butter for a snack. Mix it up – breakfast does NOT have to be boring! 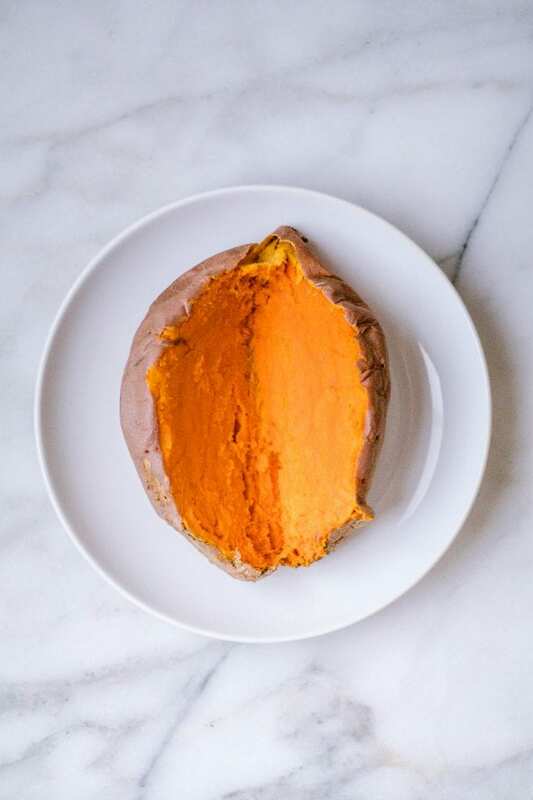 If you do not want to cook your sweet potato in the microwave, you can cook it in the oven or use your Instant Pot if you have one! 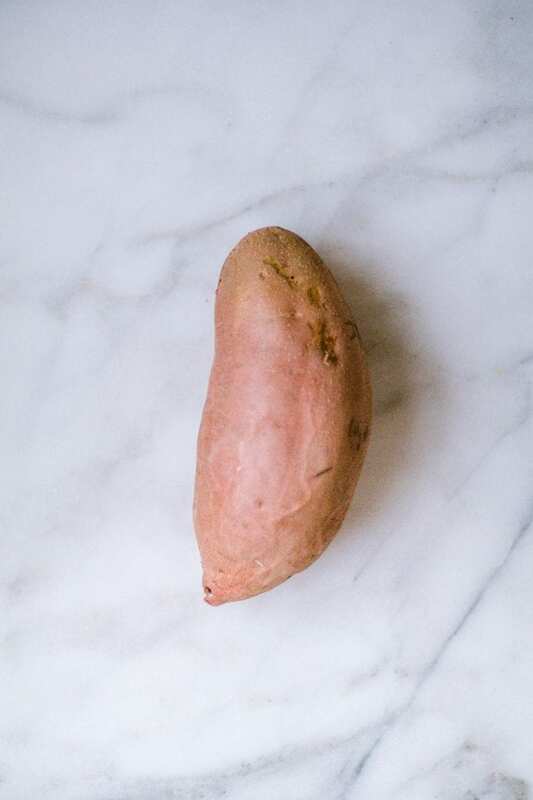 I made a quick video on how to make your sweet potatoes in the Instant Pot and my friend also wrote an entire post on it too! Say hello to your new favorite plant-based, vegetarian and gluten free breakfast! Thanks to the fiber, protein and good fats in this meal, it will keep you satisfied and full all morning! Wash and dry your sweet potato. Poke holes in it with a fork and wrap it in a paper towel and cook in the microwave until you can stick a fork all the way thru and it feels done (soft). Mine takes 8-10 minutes in the microwave. Carefully cut the sweet potato in half and place banana slices on the sweet potato. Then drizzle the peanut butter on top, followed by the chia seeds and ground cinnamon. I eat the skin and all! Such a satisfying breakfast. Enjoy! 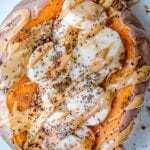 PIN THIS BREAKFAST SWEET POTATO RECIPE FOR LATER! 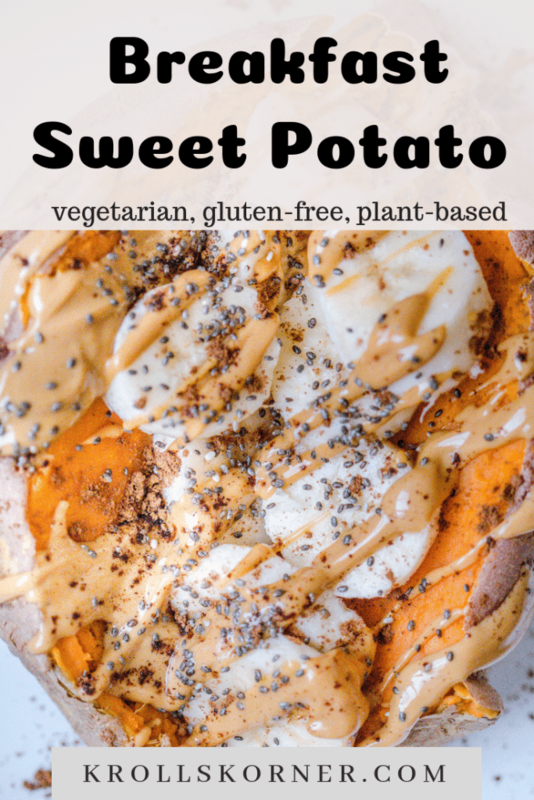 If you are looking for other sweet potato favorite of mine, let me help you out! These Sweet Potato sliders with Homemade Guac are the perfect game day appetizer! Avocado and Turkey Stuffed Sweet Potatoes make the best weeknight dinner recipe. It’s the go to recipe mid-week in my house! Thank you Amy! So easy and yummy! I need to try this. I definitely have mornings where I don’t want yogurt and fruit, or a smoothie. and I don’t want to eat cereal because I feel like that is just all sugar! This would be much more filling. Susie this breakfast is made for you then if you’re looking for something different! 🙂 Thank you! I always have baked sweet taters on hand for breakfast like this! That’s awesome! So great to have throughout the week! OMG you just blew my mind. I never thought of this combo but I will be trying it after my weekend long run! Looks so amazing! I’m going to need to find another way to cook this because the microwave is so harmful and depletes so many of its nutrients. Thanks so much for the amazing breakfast idea. Use the oven, or Instant Pot if you have one! 🙂 Thank you so much! Sweet potato and peanut butter- say whaaaat? Need to try this!